LiveMIDI uses internal synthesizer to generate audio, and supports General MIDI SF2 Soundfonts. 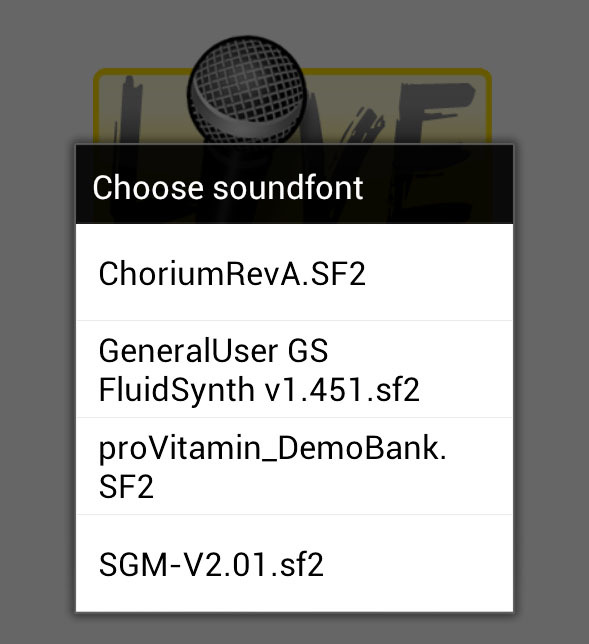 You can use your own soundfonts, instead of the one bundled with LiveMIDI, and choose which soundfont to use during startup. 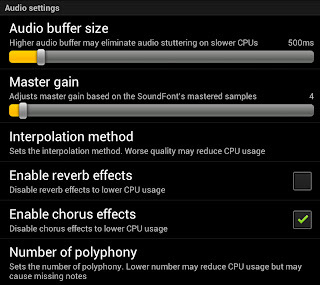 The size of supported soundfonts will depends on the RAM availability of the device. 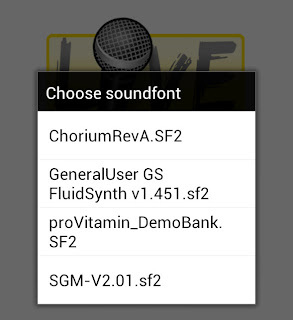 To use your own soundfonts, you'll need to copy your General MIDI SF2 soundfont files to /sdcard/LiveMIDI/soundfonts (or /mnt/sdcard/LiveMIDI/soundfonts depending on the device) folder. Start or restart LiveMIDI. 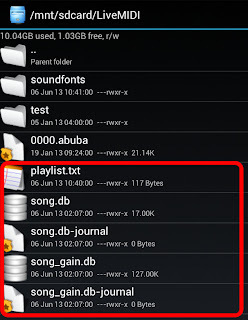 When you have more than a single soundfont file in the mentioned folder, a menu will be shown, offering options to choose which soundfont to use during the session. LiveMIDI supports several advanced audio settings, that may be useful for certain circumstances. The audio settings can be accessed from general settings, by pressing device's menu button and choosing "Settings..." from the playlist view. Audio buffer size controls the size of buffer for LiveMIDI to synthesize audio. The smaller the value, the lesser the latency. However, it may cause audio stuttering during part of the song on slower devices. Adjust this buffer size to a larger value on slower devices. Song lyrics display will be synchronized regardless of the audio buffer size. Master gain controls the gain volume of the SF2 instruments. Appropriate adjustment relative to the soundfont in use may be required. The default value for the bundled soundfont is 4. 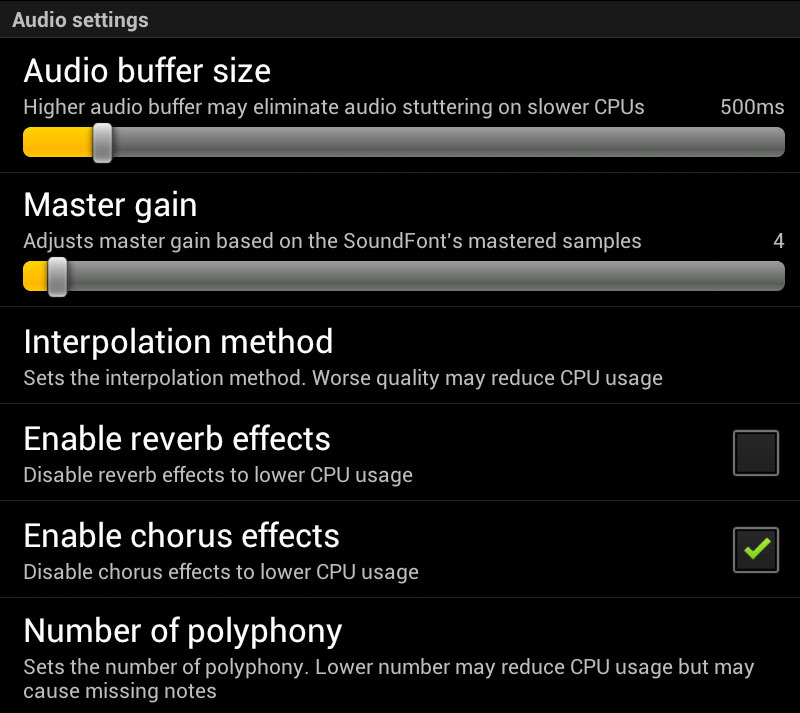 Interpolation method sets the audio interpolation sampling for the instruments, affecting instruments sound quality. "None" yields the worse quality but lowest CPU usage, while "7th Order" provides best sound quality but highest CPU usage. It is recommended to set it to either "Cubic" or "Linear" which results with good quality on most of the cases. Reverb and chorus effects controls the synthesizer reverb and chorus. Each of the settings will results in higher CPU usage. Number of polyphony adjusts the number of samples that can sounds at the same time. The default value is 128. Lower value reduces CPU usage, but may cause missing sound notes on some instrument-heavy part of the song. When you've used LiveMIDI for a while, you probably already modified some song parameters -- mixer settings, text lyrics encoding settings. The settings are stored in internal LiveMIDI configuration file, which resides in several files in /sdcard/LiveMIDI/. 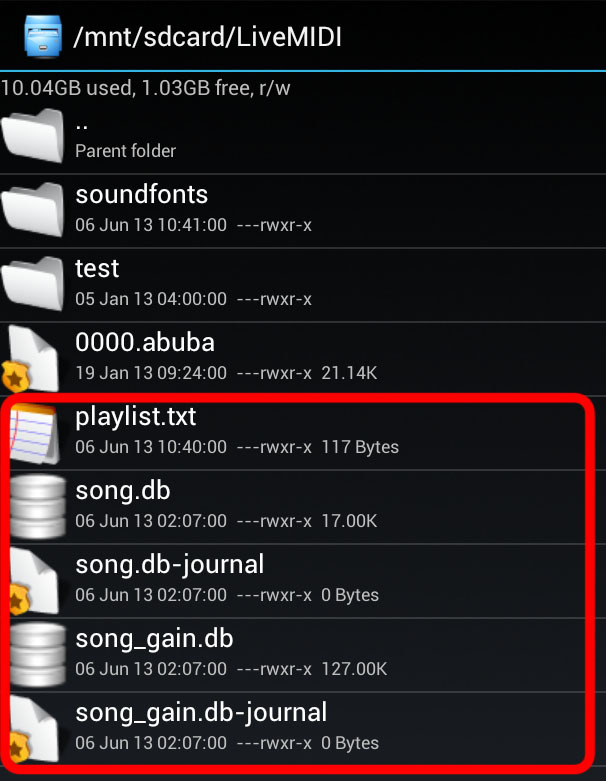 You can copy the files over to your computer for backing up song settings, or transferring the song settings to another device.